We have introduced our Important IT facilities Data Center in last issue. In this issue, let us go deeper into introducing an energy saving technology in Data Center – hot aisle and cold aisle. Hot aisle and cold aisle is a layout design for server racks and other computing equipment in a data center. The goal of a hot aisle/cold aisle configuration is to conserve energy and lower cooling costs by managing air flow. Hot aisle/cold aisle data center design involves lining up server racks in alternative rows with cold air facing at one way and hot air exhausts facing at the other. 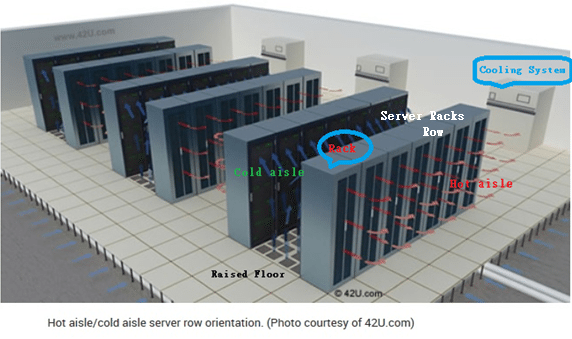 As shown in the picture, the rows composed of rack’s fronts are called cold aisles. Typically, cold aisles face cooling system output. The rows that heated exhausts pour into are called hot aisles. Typically, hot aisles face cooling system. What’s the function of Containment? 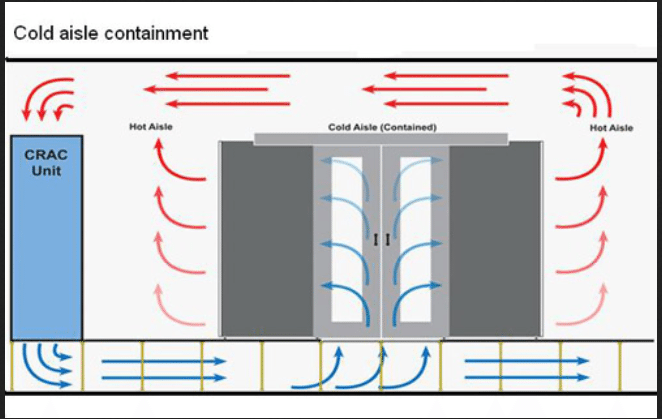 Containment of hot/cold aisles and ducting hot air from cabinets prevent cool and exhaust air from mixing within server rooms. Optimizing air flow in an enterprise data center (such as Internet Service Providers, data center service providers, computer manufacturer Dell, HP, etc.) with the use of containment has several benefits, which include reducing energy costs and improving efficiency. Containment solutions normally separate hot from cold aisles by the use of sheet metal walls, special ceilings and doors. However, designing and installing hot aisle or cold aisle containment requires not only metal knowledge but also need to rebalance air flows, air conditioning systems and fire services to maximize the benefits of containment.